Get this Veggie tales adventure and show your 3s to 9s how only faith in God conquers fear and builds the inner strength and real courage you need to face the world. All the adventure, action and real life lessons you'd expect from the Veggietales characters as they reveal extraordinary powers of Super-Fun as 'The League of Incredible Vegetables'. In fast and funny faith building battel against the chilling Dr Flurry your fruitbowl favourites come to aid of Larry Boy on his latest escapade to defeat a new and fearsome opponent, Dr Flurry. If ever a vegetable had a cold, cold heart - even before going into the fridge, it's him. With his army of equally icy penguin minions he seeks to seal the whole of dwontown Bumblyburg in a blizzard of snow. Who can stop him? Who can defrost Bumblyburg? Will Larry and his team of Incredible Vegetable super heroes (Bob, Petunia, Mr.Lunt and Junior) manage to put a stop to the coldness and overcome their fears to rescue their beloved home town? The answer is... no! Well not in their own strngth they won't, because they face an even more fearsome foe - their own fear! Get this DVD Veggie tales adventure and discover how only faith in God is able to help your little ones conquer their fears and find the inner strength and real courage to face the world and unfreeze its hardended heart. This DVD is Region 0, and will play on UK DVD players. 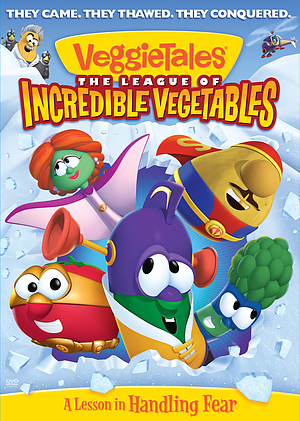 The League of Incredible Vegetables DVD by VeggieTales was published by Authentic in January 2013 and is our 2337th best seller. The ISBN for The League of Incredible Vegetables DVD is 5060256820888. Oh! I do love VeggieTales and so do my grandchildren, though most think they are too old for them now. When I received this DVD by accident (I am now retired - again) I was delighted with the opportunity to review it. At the first 'oompah' of the introduction I was smiling and little ones would soon be singing along with the familiar opening song. Junior Asparagus is afraid of all sorts of things, but when it comes to an emergency he overcomes his fears to thwart the plans of the evil Dr Flurry, he acts quickly and prevents a nasty accident. As a reward he is recruited as a Junior member of the League of Incredible Vegetables, a formidable force with many incredible suits and vehicles to help them in their quest for the vital piece of equipment Dr Flurry has had his penguins steal from Bumblyburg museum. It is not till after Larry's Silly Song halfway through that we find how the league gets on. Not too well to start with, but when Junior puts his trust in God and loses all his fears, he saves the day and becomes a full member of the League. Hooray! As good as ever - well worth purchasing! Take a peek at some articles related to The League of Incredible Vegetables DVD. Got a question? No problem! Just click here to ask us about The League of Incredible Vegetables DVD. The 51st DVD from the Veggie Tales crew brings you 'The League of Incredible Vegetables' a fun, fast-paced adventure from your favourite vegetables. It's a normal day in Bumblyburg . . . until Dr. Flurry comes to town with an army of penguins! Sounds like a job for Larry-Boy, but he gets frozen by his enemy's superior tactics. rushing to his rescue, the league of Incredible Vegetables attempts to unfreeze Larry-Boy, but can they overcome their fears and rescue the city? Thingamabob. [it wouldn’t be a Veggietale without him] and a super vehicle. And… Ricochet who at least feels brave and is… for a green vegetable. “Trust in God – not in my super suit? No: Trust in God.” – And not in ‘supper’ heroes [another bad pun, but there’s a worse one coming…] The League of Incredible Vegetables: They came, they thawed [told you so], they conquered. A lesson in facing fear from Veggietales. The League of Incredible Vegetables – Away! Sometimes you really want to know just what’s going on inside the head of Veggie Tales creator, Phil Vischer. Whatever it is, the one thing you can be sure about is that it never stops. His mind is constantly creating new ideas, new characters and new adventures for his fruit and veg based heroes. If the output Phil’s mind could be connected to the electricity grid, there’d be enough energy to power a small ton, a whole street, surely… or just a house, OK but at least a fridge, maybe. In this DVD Veggie Adventure, ‘The League of Incredible Vegetables’ Phil’s creations really are the heroes and heroines, as they struggle against a plot to refrigerate them all – permanently. Stealing his veggie villain’s name from a popular frozen dessert, Phil’s Dr Flurry – complete with quirky German accent, is about to freeze solid the whole of the sunny little town of Bumblyburg. Part of Phil Vischer’s genius for creativity and originality is to steal it from others. Well, you could call it stealing, or could just call it repackaging or even recycling. A look at the featured video clip on this page will show you what I mean and why your children will love this high quality computer animated adventure with its strong themes of personal development, facing fear and finding courage. Obviously the title is lifted from the comic book stories and from their recent remakes as big box office movies. The type face for title on the clip and on the DVD pack looks suspiciously like Disney’s ‘The Incredibles’, and the projected ‘Veggie’ sign reminds you of the ‘Bat Sign’ used to summon Batman to the aid of Gotham City. Petunia Rhubarb's apperance in the role of Vogue is Phil's fashion conscious take on the X-Men character, Rogue.The vehicles zooming your fruit and salad heroes through the streets of Bumblyburg look very like colourful repaints of the cars and bikes used by the cape crusader and his equally caped side kick. Capes and costumes figure heavily on the four heroes of the tale while their nemesis, Dr Flurry shows all the necessary traits of a super-villain evil genius. Another borrowing here – Flurry is assisted in his dastardly plans by an army of penguins unmistakably similar to the loyal and laughably inept ‘minions’ of Gru in the animated feature, Despicable Me. Veggietales more recent offerings work so well for children 3 to 6 (and up to 10 times that) because they have these recognisable themes and references. It makes them ‘mainstream’ and part of the total DVD and movie culture adults and children live in. Some of the references are clearly for grown ups to enjoy and children to grow into – just like the big studio CGI movies that Phil liberally borrows from. who are The League of Incredible Vegetables? Just who are The League of Incredible Vegetables? Well here they are with all their super skills, favourite heroes of their own, fears and fab vehicles! Super Ability: Can get out of any situation – even work! In this Veggietales take on superhero movies, Bob the Tomato and the League of Incredible Vegetables battle the icy genius, Dr Flurry, and his minion army of evil penguins. As the caped crusading fruit and veg fight to halt Dr Flurry’s plan to burry their town in freezing ice and snow, they find they have an even greater foe to face – their own fears. In this fun filled lesson of faith, your 3s to 8s learn that only God can help you find the inner strength and real courage to face the coldness of the world and unfreeze its hardened heart.